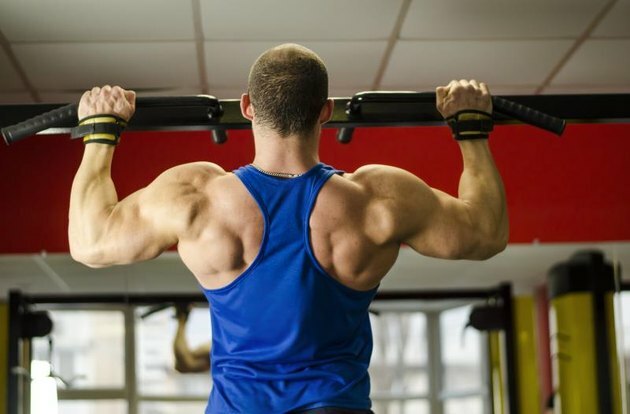 Do Pull-Ups Work Your Chest? If you seek the coveted "V-shaped" torso like other bodybuilders, pull-ups are an essential exercise to include in your lifting regimen. Although a number of muscles assist the back in completing the pull-up, the primary muscle of the chest, the pectoralis major, isn't one of them. The primary muscle used in a pull-up is the latissimus dorsi, a broad, long muscle that covers much of your back. 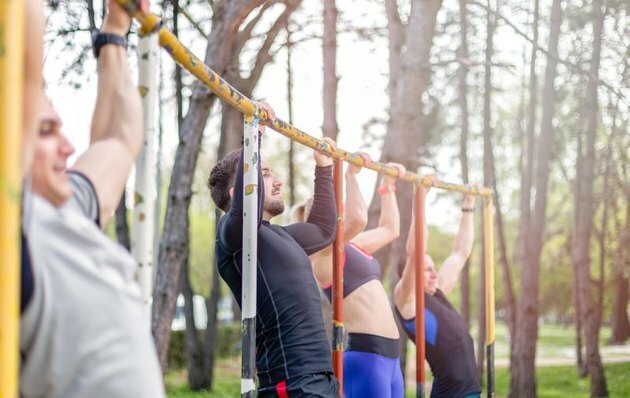 Assisting the lats in the pull-up are the muscles of the forearm, the biceps, the backs of the shoulders, the rhomboids and the trapezius muscles, as well as some of the smaller muscles of the rotator cuff. The only chest muscle directly involved in the pull-up is the pectoralis minor. It spans over the third and fifth rib and attaches at the scapula -- part of the shoulder. The pec minor sits under the pectoralis major, the broad fan-shaped muscle that makes up most of the chest wall. Although the pec minor is essential to posture, function of your shoulder and breathing, it's not a muscle that you build to add size and definition to your chest. To execute a pull-up, your arms are wide and your hands grasp the bar with an overhand grip. With a chin-up, your arms are closer in toward your body and hands grasp the bar with an underhand grip. This change in arm position alters the muscles used in the exercise. Although the lats are still primary, and most of the same muscles assist, the middle-to-lower portion of the pectoralis major, known as the sternal region, also engages to help your back do the work to pull you up. A chin-up doesn't target the pecs directly enough for it to be considered a chest exercise, though. The American Council on Exercise sponsored a study in 2012 that revealed the most effective exercises for stimulating the muscles of the chest. The top three recommended for the best chest development were the bench press, bent-forward cable crossovers and the pec deck machine. ACE recommends you use these exercises interchangeably as they all offer the same level of pec activation. For a full chest workout, include all three for two to four sets containing eight to 12 repetitions using weight that feels heavy by the last few efforts. What 3 Muscles Are Used on the Shoulder Press?